Elmer an I were the youngest children in the L. F. Quint family. Since Clarence was married when we were small, we always thought of Elmer as being the only boy in a family of girls. Father felt he needed two "boys" so I became the other "boy", as long as we both were at home Elmer and I played together and worked together. I could always depend on him to see that I had a way to go to all of our activities. 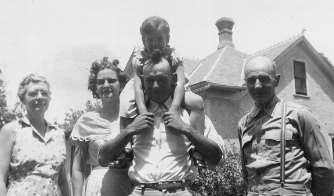 By the time Elmer reached his tens, Father depended upon him to help with all the farming. He always trusted Elmer's judgment in business matters. Before Fathers death, he turned his business affairs over to Elmer, who looked after the business very efficiently. When the estate was settled, Elmer and Florence acted as Executors and everything was done in a business-like manner. He was very anxious that Clara have a home after she had taken care of the folks in their declining years, and was instrumental in seeing that she was granted enough ground from the town property on which a small house was built for Clara. Mabel and Grace also helped in the furnishing of this house and Clara enjoyed her home very much. After Clara's death, Jennie purchased this property and is making her home there. When about 16 years old, Elmer bought his first team of horses. Beecher and Charlie were a matched sorrel team, smaller than the other work horses and suitable for driving. He was very proud of them. Every young fellow decorated the harness of the 'buggy team' with numerous, colored celluloid rings and they were quite colorful, and Elmer's team was no exception. During muddy weather they would braid the horses manes and tails, weaving bright colored rings in the braids. They looked quite fancy! Elmer and I went many places with this team and buggy. 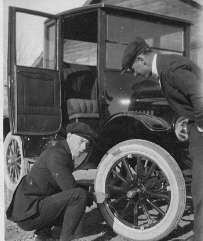 Photo of Phil, Elmer & Model T Coupe. Very few young fellows had cars at this time, so Elmer and I still used the team and buggy for it was more fun to go along with the gang. About 1919 Elmer bought a Mode-T Ford Coupe and we made many trips in this car. Sometimes, Elmer would drive 30 or 35 miles per hour which was fast in those days considering the car and the road. Father used to think we were speeding, and we would receive a warning bout driving 'too fast'. Elmer purchased a good many acres of Graham County land and was a good and prosperous farmer. He married Veva Morris in 1922 and they took an active part in the community where they lived. They were active in 4-H work while their son, Gene, was growing up. Elmer served in various capacities in Millbrook township where they lived. At first all of his farm work was done with horses and horse-drawn machinery. Later he farmed with a tractor, but he always had a riding horse on the farm. He enjoyed his son Gene and daughter-in-law, JoAnn and their family. He always visited with Florence when he came to town, and he and Veva were always thoughtful to take Florence and Jennie for rides out in the country. Veva and Elmer often visited us in our home and we always enjoyed their visits.